Liverpool, September 2018. Raising The Roof, the international concert held in support of The International Council for Caring Communities (ICCC) International Student Design Competition Fellowships, returns to the iconic St George’s Hall in Liverpool on November 1, 2018 with another star-studded line-up celebrating accessibility to life’s opportunities. The first time Raising The Roof was held in October 2017, it was a resounding success. The glittering fund-raising celebration honoured the winners of the ICCC International Student Design Competition and supported the Fellows and architectural leaders of the future. 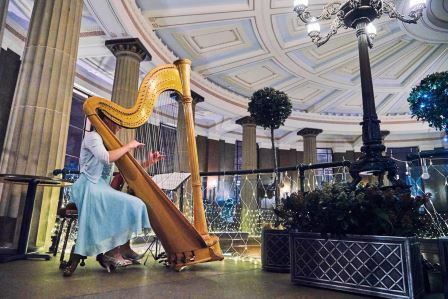 It had a spectacular line-up of musical and dance talent, which took to the stage in the sumptuous Concert Room at the grade I listed landmark – St George’s Hall in Liverpool. This year Universal Inclusion, hosts and organisers of Raising The Roof, have extended the concept of accessible spaces and inclusion to present a ground-breaking and interactive afternoon seminar, bringing together global thought-leaders, artists, architects, entrepreneurs and key decision makers in all things art and culture. This will be followed by a VIP reception where guests will have the opportunity to mix with the amazing international talent, speakers, dignitaries and guests before settling down for another stunning Raising The Roof concert, which will bring these concepts to life. The spectacular evening features awards and star performances of music and singing from internationally renowned entertainers: Asa Murphy, Matthew Wadsworth, James Holt, Napua Davoy, and the Chinese Pagoda Youth Orchestra. It will also celebrate this year’s ICCC Award winners for the Caring Citizen of the Humanities, recognising the contributions they have done and continue to make. Master of Ceremonies is Dan White. The day’s events are being hosted and organised by Universal Inclusion, led by Seminar and Concert Executive Producer Jacqueline Winstanley, Founder and CEO of Universal Inclusion. The Concert Musical Director is John Kiehl, co-founder of Soundtrack Recording Studios while Ellen Kerr from Merseyside Woman of the Year (MWOTY) is the Stage Manager. As Jacqueline explained, “All that I do through Universal Inclusion and my other initiatives is in line with my deeply-rooted conviction to do what is possible to increase the equality of access to life’s opportunities for everyone. This year’s Raising The Roof production is in partnership with the ICCC* and Liverpool City Council, and supported by Courage and Sparkle, Disability Today, Evermore Wellbeing, Gooseberry Pink, Jigsaw Medical, LMA Liverpool, Merseyside Woman of the Year (MWOTY), Pink Shoe Club and St George’s Hall. The organising committee includes Mike Cash; Noreen Cesareo, Market Accents; Professor Dianne Davis, ICCC Founder; Julie Fernandez; Christine Gong, Co-Founder, Chinese Cultural and Art International Organization; Christoff Karla; Ellen Kerr; Professor Gisela Loehlein, ICCC Vice President for Student Design Competition; Peter Mathius; Emanuel ‘Manny’ Perlman, Alan Smith and Tony Thompson. *The ICCC acts as a bridge, linking government, civil society organizations, the private sector, universities and the United Nations in enhancing new ways of viewing an integrated society for all ages. These events are also aligned to and supporting the United Nations Sustainable Development Goals. They foster the ICCC program: “Imagining the Possible”. Further details on the event as well as speakers’ and performers’ bios can be found at here.